Tribune, and The London Times. The Nature of Personal Reality. 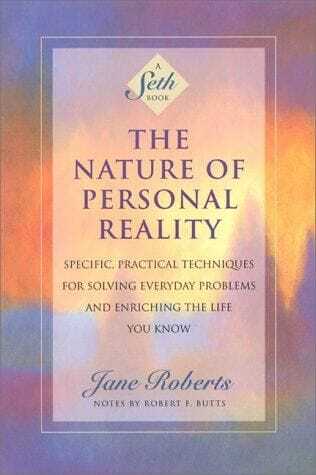 The words of Seth, the personality channeled through Jane Roberts, show readers that they possess hidden powers within themselves that have the potential to transform their lives. By learning to control their own experiences, they can create a new, fulfilling reality. Profound, loving, wonderful. It changed my life. This book is, along with "Seth Speaks", and a few of the other "Seth" books, the most important set of books I have ever read. The information comes from a personality known a "Seth", a teacher who was channeled by Jane Roberts. Seth has lived many lives on Earth, and his perspective, as one who once lived here but now "resides" in another dimension, is riveting. I know many people will find it very weird to consider the idea that a "dead" person could channel information, but after reading this book I think you will be convinced. The book is about meta-physics in the truest sense of the world - above physics. Unlike religion, which presents a set a dogmatic beliefs, this book presents non-judgemental information.The approach is "try it; if it makes sense to you, use it." Some of the insights have to do with how we shape our own reality. Seth teaches us that we always have a choice about what is happening in our lives, and provides insights as to why seemlingly bad things may be happening. In all cases, these things have to do with something that we have chosen. Its not about karma, or retribution, or atonement. Its more about creating the kind of life you want to have for yourself. Once you realize the mechanics of things and how the universe works, you can shape your life to better suit you. This is what I mean by meta-physics. This book is almost a "how to guide" of the universe. Once you know what the mechanisms are, you have a much better time understanding how to use them. I don't mean to say that this is simple. The lessons are often complex and difficult to make sense of. Part of that has to with the notion that the way in which our earthly thought process works only captures a very small part of what the universe is all about. Our brains don't always "get it." But the good news is that our "souls" do. I can honestly say my life was dramatically improved by this and the other Jan Roberts books. They take a lot of work - you have to be willing to let go of lots of concepts you've spent your whole life building. But if you do, the world starts making a whole lot more sense. What more can one ask of a book?